The U.S., South Korea and Japan undertook a joint bombing exercise Sunday, dropping live ammunition on a test range in South Korea. The mock attack was a show of force in retaliation to North Korea test-launching a ballistic missile that flew over Japan Thursday. The mission consisted of two bombers from Andersen Air Force Base in Guam, four Marine F-35B from a U.S. base in Iwakuni, Japan, four Korean fighters and four Japanese fighters, according to a press release by U.S. Pacific Command. “U.S. Pacific Command maintains the ability to respond to any threat in the Indo-Asia-Pacific theater at a moment’s notice,” said the release. The bombing run comes at a time of heightened tension between the U.S. and North Korea. The Thursday missile launch was the second time in less than three weeks that North Korea sailed a missile directly over Japan. The United Nations (U.N.) Security Council passed ever-stricter sanctions on North Korea last week on Monday. The sanctions came after North Korea conducted its sixth and largest nuclear bomb test. North Korea claimed the test was a thermonuclear hydrogen bomb. Updated analysis of the blast by experts say that the North Korean claim is likely accurate. President Donald Trump mocked North Korea’s leader, Kim Jong Un, Sunday calling him “Rocket Man,” on Twitter. “I spoke with President Moon of South Korea last night. Asked him how Rocket Man is doing. Long gas lines forming in North Korea. Too bad!,” tweeted Trump. North Korea fired back Monday calling the sanctions “the most vicious, unethical and inhumane act of hostility,” via their state media wing, the Korean Central News Agency. 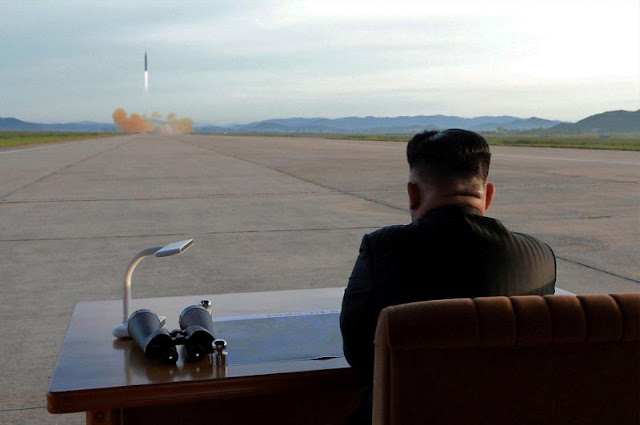 North Korea also test-launched two intercontinental ballistic missiles in July, proving the country theoretically could strike the continental U.S. with a missile.